Psychology and Human Development majors cultivate an understanding of the biological, psychological, spiritual, and socio-cultural development of the human being throughout the lifespan. This interdisciplinary program studies development from infancy, childhood, and adolescence to adulthood. Psychology and Human Development core and elective courses prepare students for fields in human services. With your knowledge of human behavior, you can help people cope, grow, and thrive to help meet the mental health needs of society. You can help children with disabilities find new ways of learning, or counsel a couple about their genetics and what it means for their future. You can even research workplace behavior to help companies find new avenues of productivity. 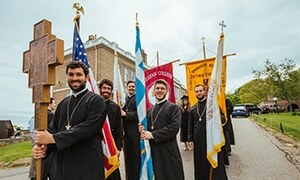 All this can be achieved, while also cultivating your Orthodox Faith at Hellenic College. One must have the personality to be able to support and help patients. One must have the scientific and technical knowledge necessary to make the correct decisions regarding patient care. One must have the clinical skills necessary to implement this knowledge. The Psychology and Human Development program prepares students for such vocations through interactive courses (e.g., professional development seminar, cultural competence, self-care management, etc. ), junior year pre-practicum placements (e.g., trauma centers and addiction centers), and senior year practicum placements. The Psychology and Human Development program is designed for students who want an applied practitioner-oriented approach to develop an advanced understanding of the issues and needs of children, youth, and families in the 21st century. The program enhances skills necessary for self-reflection and service-orientation, such as critical thinking, communication, and insightful reasoning. Graduates pursue a wide variety of different careers and graduate programs. Graduates often pursue vocations working with children, youth, and adults in human, social and government agencies. A degree in Psychology and Human Development leads to post-graduate study in such fields as psychology, pastoral care, sociology, education, academia, and various health fields.